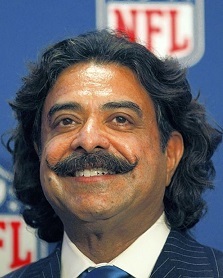 In the two full seasons in which Shahid Khan has owned the NFL’s Jacksonville Jaguars, his team has been the worst in the league — winning just six games and losing 26 while residing in the AFC South basement. In that time, the billionaire businessman and Pakistani-American Muslim says he has learned some lessons about how to build a winning football team. “I’ve been in the league two years and the first year, we were two players away from making the playoffs so we spent $40 million in free agency on 2-3 players and we know what happened,” Khan told the Orlando Sentinel, referring to his being convinced by Jacksonville’s then-GM that the team was close to being a serious contender. The Jaguars have the No. 3 overall pick in May’s NFL draft. While that puts them in position to take one of the handful of highly-touted quarterbacks on the board — including local products Blake Bortles and Teddy Bridgewater, who would definitely help sell tickets — some experts predict the Jaguars will either use that pick on a defensive player, or trade the pick to acquire more picks later in the draft. Jacksonville has added seven players in free agency this offseason, most notably running back Toby Gerhart (Adrian Peterson’s backup in Minnesota) and defensive linemen Red Bryant and Chris Clemons, both of whom won a Super Bowl with the Seattle Seahawks.